For an exam task at school, we had to find a piece of art that appealed to us. After a long search, I found Junior Fritz Jacquet. This artist works mostly with recycled materials, something that will be noticed in this disposable society. He works with cardboard and he has a great work with toilet rolls. Yes, toilet rolls are art! 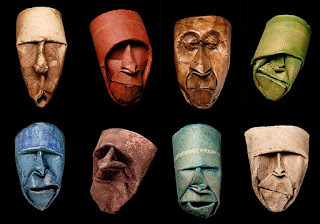 This work was made ​​from toilet rolls. I think it's brilliant! How he can capture a facial expression in such everyday materials. I tried it myself but it unfortunately didn't work out so good, maybe after some more trying. ziet er supervet uit ! elke woensdag, vrijdag en zaterdag !